If you are about to launch a new ecommerce website or modernise the existing one, and you are tight with your budget, the best way to get up and running quickly is to use a ready design theme. For maximum $200 you can have a nicely designed theme with a coulple of additional features. You won’t get a unique design for your online store. Though some themes allow you to adjust certain design elements to go well with your branding needs, it still won’t be an exclusive design. If you want your site to reflect your brand’s look and feel, hire Magento developers to customize the theme. The chances to buy a poorly coded theme are high. As a result — additional costs for bug fixing. The range of themes for some niches is very limited. It may happen that you’ll buy the same theme as your competition. That’s…ehmm… not the best option. In this article we’ll try to give you a couple of tips on how to reduce the pain when selecting a Magento theme (including the above mentioned issues), and also introduce 5 Magento fashion templates that you could use for your ecommerce project. Familirize yourself with usability and accesibility guidelines — the very crucial aspects of website design that are often neglected by store owners. Letting your customers find products easily and quickly is as important as having a visually appealing design. Look for the theme that your audience will like. Not only you. Spend a couple of minutes to decide what you are looking for before you dive into theme search. You can save yourself time and effort. Select a paid theme. Free themes tend to be of a lower quality than the ones you pay for. The other thing to bear in mind: as a rule, free themes are not supported by their developers. It’s a gift that you have to take as it is and not to expect any additional bonuses (updates, fixes). Buy from a reliable theme supplier like Template Monster that makes careful theme pre-selection. However, nobody still can garantee that the theme you buy will be completely bug-free. Look only for responsive themes. The majority of themes showcased at the marketplaces are responsive. But, you still may encounter those that are not optimized for mobile devices. Try to get “all-inclusive” scenario by choosing a responsive theme from the very beginning. Make sure the theme is compatible with your Magento version. Check ratings and reviews. Bad theme — bad reviews. Pretty obvious correlation. You will definitely find feedback on what was wrong with the theme, if it’s the case. When it comes to positive reviews — the first three-five messages like “wow great theme! GLWS!” or “Creative Job, Like it, GL” are not worth paying attention to. Look for those that you have feeling are from real theme buyers. If the theme is brand new, and there are no reviews available yet, visit the page of the theme manufacturer and see what’s going on there. What reviews do their previous themes have? If there were any issues, check how responsive the team was. Select the theme that has flexible customization options. Read carefully the info provided by the development team and try to find out whether it’s possible to customize the theme (colours, fonts, layouts) without touching a single line of code. Check the performance of the theme demo. Test the theme load speed using online services like Google PageSpeed Insights. Test, test, test! Go through all the pages of the demo to make sure that everything is up and running. In case, you’ll detect anything is broken, it’s a clear signal you have to look further. And now, we’ll walk you through fashion themes that have drawn our attention. A couple of examples, just to give you an overview what’s availabe on the market for fashion industry. One of the most popular Magento themes ever that has stood the test of time. Just look at the number of downloads! 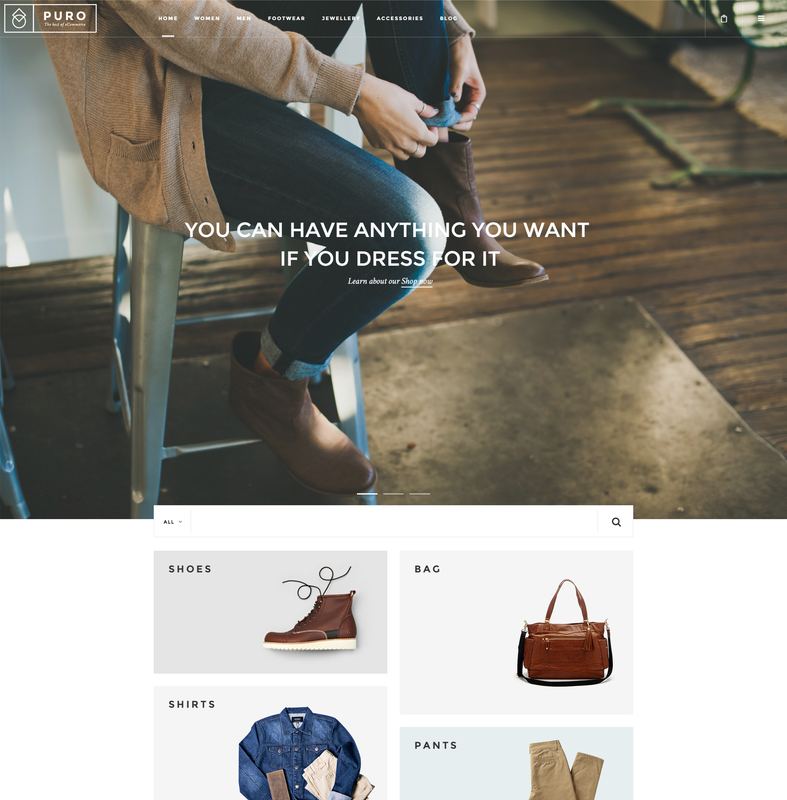 The theme is a great candidate for fashion online stores, since it is extremely customizable and offers a huge suite of options including unlimited color variations, mobile-friendly mega-menu, Google fonts, custom font stack, Cloud Zoom + Lightbox, lasy loading, responsive sliders, 50+ CMS content blocks and many many more. 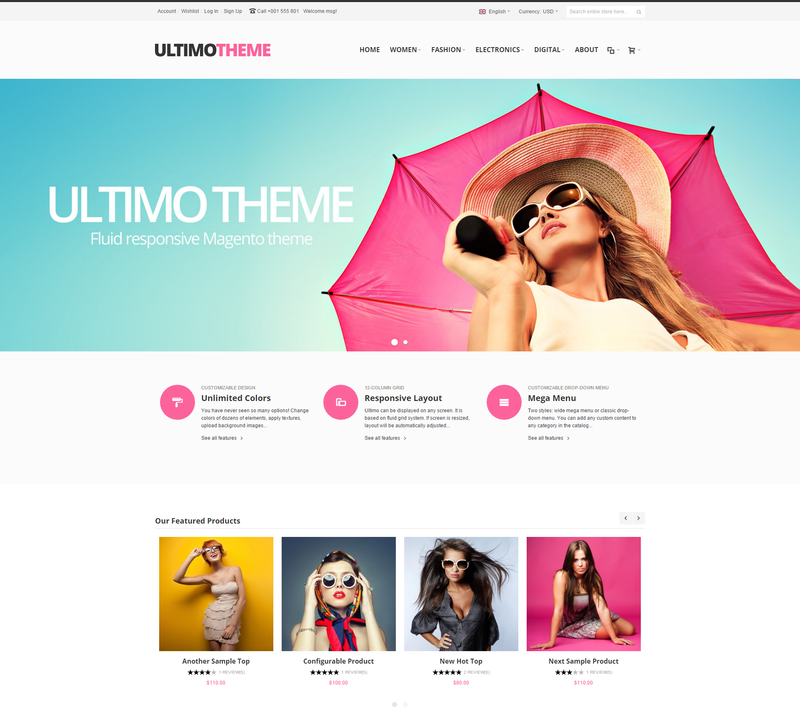 Unlike other themes with Ultimo you have the ability to create sub-themes — variations of Ultimo template — and use them whether for multiple stores or season-specificly. The theme is constantly updated and improved by Infortis team, so you may expect even more nice features. One more huge bonus — Ultimo theme comes with 200-pages user guide. Milano is another nice theme for fashion sites. Its clean and beautiful design, product-centric layout work perfectly for selling fashion products. The theme comes with a variety of cool extensions: color swatch, Google rich snippet, countdown timer, Ajax infinite scroll, Revolution Slider, QR codes and “Look of the day” feature. Configure and enjoy! Furthermore, it has an integrated blog that makes it possible for you to blog in style and let your content catch the attention of your site visitors. What is also worth mentioning: the theme is properly coded and is very flexible in its settings. We have used it a couple of times and were satisfied with it. Beautifully designed theme with a great deal of space to feature fashion items. The theme has a lot of customization options including pre-built page layouts and multiple colours and fonts that allow you to adjust the look of the site in order to make it more unique. Also, the theme is equipped with such goodies like popular Ultra Mega Menu, blog functionality, “Deal of the day” feature, advanced search, quick view and newsletter extensions. If you like the overall appearance of the site, maybe, there is no reason to look further. Zorka theme is the ideal jumping off point for almost any fashion business. It includes a variaty of skins and offers limitless colour options to go well with your brand style and identity. Plus, it offers a lot of extras like blog, mega menu, sticky header, Ajax price filter and Revolution slider. The theme is carefully crafted to give your customers a great shopping experience. The last theme we want to introduce — the fashion theme by Hermes team. Its elegant and modern design perfectly matches the needs and aesthetic of the current fashion industry. Right away it grabs the attention of users with large imagenary and pleasant colour scheme. Such goodies as mega-menu, Ajax shopping cart, social options, color swatches and product list gallery make the theme more user-friendly and interactive. It makes people love it from the first sight. Off-the-shelf Magento themes are handy if you have a tight budget for marketing your products or services. For relatively small amount of money you’ll get a modern theme with fresh design. However, if you are concerned with your brand continuity, it’s still better to go for custom Magento design that will be created in accordance with your requirements and needs.